Double exposure trick for the LPCT competition. 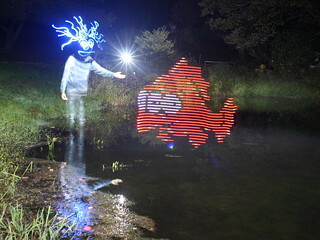 Darius Twin suggested Blinky for a shot. Now that Dappy's gone, Tackyman needed some new pond pals anyways. Switch to f/11, Pan camera left for a new frame over the grass. Create Blinky with the DLW. Repeat until you get close enough to be content.